U.N. Secretary General Ban Ki-moon on Friday called on Egyptians to prevent the further loss of life amid heightened tensions between supporters of ousted President Mohammad Mursi and the interim government. Ban’s “immediate concern is for the leaders of Egypt, on all sides, to exercise their leadership and their responsibility to do whatever can be done to prevent further loss of life among the Egyptian people,” a statement from his spokesman read, according to AFP news agency. The statement came on the occasion of Eid al-Fitr, the holiday marking the end of the holy Muslim fasting month of Ramadan. Expressing deep concern over the political stalemate in the country, Ban said it was of critical importance that all sides in Egypt -- those in positions of authority as well as those protesting in the street – “urgently reconsider their current actions and language,” the statement read. Ban “applauds the deep courage and commitment of the Egyptian people” towards peaceful change since mass protests began in January 2011. 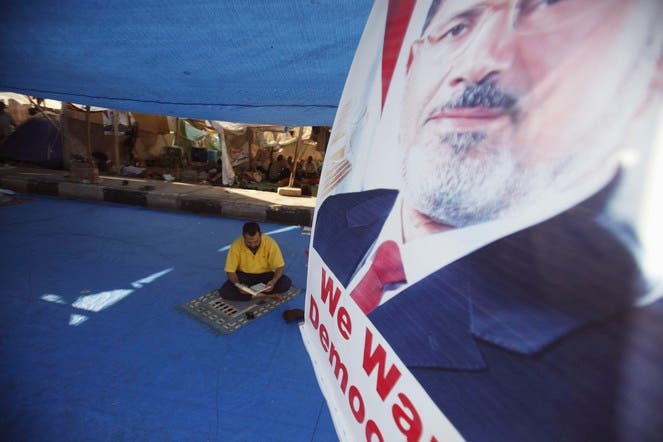 Defiant Mursi supporters rallied in their thousands across Egypt on Friday, sparking clashes that left dozens injured, as interim premier Hazem el-Beblawi suggested that a crackdown on their protest camps was imminent.